Universities Minister Sam Gyimah MP and the Times’ satirical columnist Matt Chorley joined a lively student event. The event, entitled ‘What the hell is going on?’, launched Imperial’s partnership with the Times and Sunday Times . 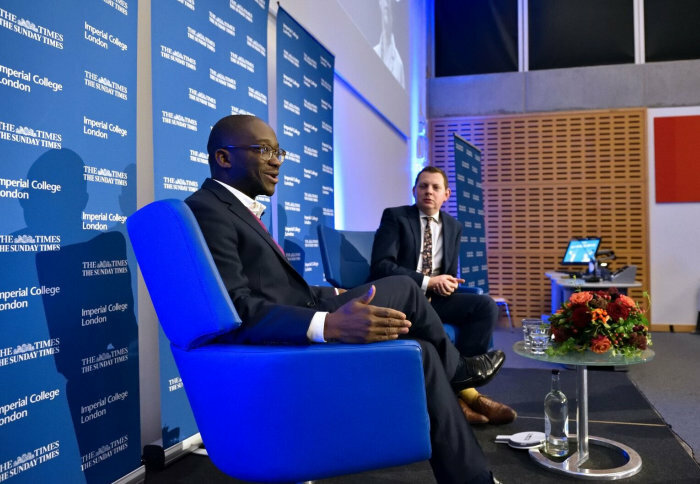 Matt Chorley led the Q and A with Sam Gyimah, as he and Imperial students interrogated the Universities and Science Minister on Brexit, tuition fees, social mobility and the Prime Minister’s future. Imperial and the Times are joining forces to provide free online subscriptions for all students, and the opportunity to become Times Student Ambassadors. Five students will be specially selected by The Times to help drive, promote and encourage participation in the programme of activity throughout the year. Luke Blair, Imperial’s Vice-President (Communications and Public Affairs), introduced the event, hailing the “special new partnership” that has been formed between Imperial and the Times. The aim is to inform, stimulate debate and explore the future of science, technology and culture, and the partnership will include more debates and discussions featuring students, special guests and Times journalists, he said. Matt Chorley asked Sam Gyimah about his background and upbringing, as well as his role as Parliamentary Private Secretary to David Cameron. It was the Minister’s second visit to the College this month, after visiting Imperial’s Enterprise Lab to launch the second phase of his Higher Education Open Data Competition. All students and staff at the College have been given a free subscription to The Times and Sunday Times as part of the partnership. Individual emails containing a unique URL to redeem this offer were sent out by the College last week.